ROTTERDAM, Netherlands - QuantaDyn Corp., an engineering firm specializing in training and simulation, is demonstrating a rapidly prototyped Joint Terminal Attack Controller training system at ITEC 2017 in Rotterdam, May 16 -18, that offers an unprecedented level of visual realism by using Bohemia Interactive Simulations’ whole-earth rendering technology VBS Blue IG. QuantaDyn will showcase a force-on-force Major Combat Operations (MCO) fight against an enemy with the same capabilities as the friendly forces. ITEC 2017 attendees can expect to see the JTAC deal with enemy surface-to-air threats, enemy armor and APC's, enemy rotary wing aircraft and collateral damage considerations. The JTAC training scenario will be presented on a 4-channel, 4-meter dome system at 2K resolution with incredibly realistic geotypical terrain from VBS Blue merged with geospecific roads and building footprints from TerraTools, TerraSim’s flagship terrain generation software. The scenario will be driven by Modern Air Combat Environment (MACE) from Battlespace Simulations Inc. and QuantaDyn’s communications middleware DIScover will provide interoperability capabilities. 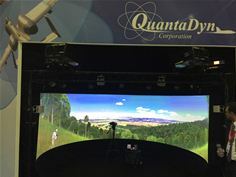 With VBS Blue as part of the QuantaDyn demonstration, JTACs are able to view the scene at the fidelity prescribed by the DORI (Detection Orientation Recognition Identification) requirements at the default field of view. VBS Blue visuals include views of clouds, subcentimeter ground detail, and vegetation blowing in the wind. Moving ground vehicles, helicopters, and fast jets are equipped with representative physics. JTACs will be able to target buildings and vehicles in the simulation, call for close air support, and conduct battle damage assessment. VBS Blue provides high-fidelity and high-performance rendering from space down to blades of grass for all training applications. In late 2017, VBS IG customers will be able to harness VBS Blue for image generation. The VBS Blue IG upgrade will be provided as part of normal updates. See demonstrations at QuantaDyn’s stand #18 during ITEC. QuantaDyn provides simulation and training solutions, services, and support, specializing in Joint Fires Training Systems that leverage the expertise gained in delivering our Joint Terminal Control Training Rehearsal System (JTC TRS) and Advanced JTAC Training System (AJTS) products. Our mission is to provide modern, innovative answers to training needs, whilst taking full advantage of commercial-off-the-shelf (COTS) technology. Our experience includes virtually all phases of training device development for Joint Fires as well as both fixed and rotary wing aircraft for use on both military and commercial training systems programs. Founded in 2001, Bohemia Interactive Simulations (BISim) is a global software company at the forefront of simulation training solutions for defense and civilian organizations. BISim utilizes the latest game-based technology and a large, experienced in-house team of engineers to develop high-fidelity, cost-effective training and simulation software products and components for defense applications. Learn more at bisimulations.com.